The Alphaeus Barbour House is one of two heritage homes in Newtown built by the Barbours, one of the most important sealing families in Newfoundland history. Alphaeus Barbour House is an outstanding example of the Queen Anne Revival style. The house was originally built for Captain Alphaeus Barbour, one of Benjamin Barbour's sons. Construction was started in 1904 and did not finish until 1907. In 1925, the house was sold to Samuel Barbour and passed down to Edward Barbour. The house remained in the Barbour family until 1993 when it was purchased by the Cape Freels Heritage Trust. 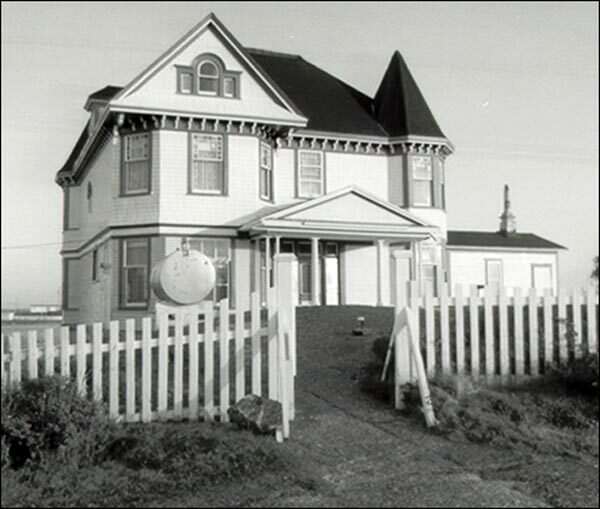 The Barbours were considered one of the most important sealing families in Bonavista Bay. Fourteen of the descendants of Benjamin Barbour became captains and ten of those were sealing captains. Other sealing families of note include the Keans, the Winsors and the Blackwoods. The Barbours were also involved in trades outside the sealing industry. Most were involved in the fishery, especially the Labrador fishery. The family also established and maintained a business in Newtown, until the early 1990s. As well, the family operated a passenger boat service from 1942 until a road connected all the settlements it serviced. All of this made the Barbours vital to the economic well-being of the small community. The Alphaeus Barbour house is a three-storeyed wooden house in a Queen Anne Revival style that was popular with the Newfoundland merchant class at that time. The house is a timber-framed structure built with pine. It has bay windows, floral glass works and a tower on a corner section. One of the most intricately-designed houses along the North Bonavista Bay shoreline, it has been the subject of paintings by famed Newfoundland painter, David Blackwood. Located near Benjamin Barbour's heritage home, it is also on a point of land close to the water. During the Barbours' peak years, the shoreline near the house was completely developed with storehouses, fishing stages, wharves and a general store. The Alphaeus Barbour Home remains in excellent condition and is considered a major tourism draw along that part of the coast. The Heritage Trust currently uses the house as a museum, preserving many of the artifacts and furniture for visitors to see. The house was recognised as a Registered Heritage Structure in December 1986. The building was awarded the Southcott Award for heritage restoration by the Newfoundland Historic Trust in 1998. Also view the Alphaeus Barbour House Registered Heritage Structure on the Heritage Foundation of Newfoundland and Labrador web site. The Newfoundland and Labrador Heritage Web Site has on its site only a portion of the registered heritage structures in Newfoundland and Labrador. To view a complete list or search for a particular structure visit the Heritage Foundation's Property Search page.